Andie Smith, CAFMA Assistant Fire Marshall will speak at the Feb 20 Dewey-Humboldt Firewise Community Meeting, 6:30 at the Town Hall. In 2016, Andie Smith, Assistant Fire Marshal with Central Arizona Fire and Medical Authority (CAFMA), did the first fire risk assessment for our Dewey-Humboldt community. • As a trained Fire Inspector, Andie worked with Firewise Director Vickie Wendt to help our community take first steps for firewise certification. • Her assessments determined the 2 most critical areas to be Blue Hills and Foothills. • From there, D-H Firewise sought certification, education, and abatement grants for these areas. • For those who choose to abate their property, Andie is one of the inspectors who works with them to begin the abatement process. • From there, D-H Firewise has grown to reach out to all areas of our D-H community with fire safety measures. Wildfires across the United States have cost more than 100 lives and more than $25 billion dollars in property losses in just the last two years. Help promote wildfire safety in your community by working together on a wildfire safety project. Take the first step on your journey to wildfire preparedness by participating in projects on May 4. You can help your neighborhood create a sense of community by working together on a project that can make a difference. You can help promote wildfire safety by encouraging residents to work together on a project or event. Participation helps create a sense of community, where neighbors begin to look out for each other. 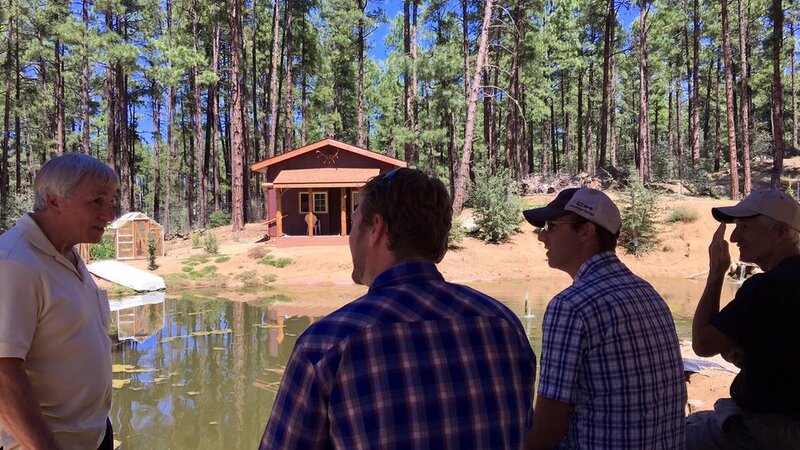 Wildfire Community Preparedness Day projects can also help strengthen relationships between residents and the local fire department, land management agencies, community leaders, and elected officials.See a list of possible projects. The National forms are in the Firewise Assessor Training book published by AZDFFM. We recommend the training including the training manual and these forms. The first 2 pages strongly emphasize the home structure itself and the second 2 pages strongly emphasize the area around the home. 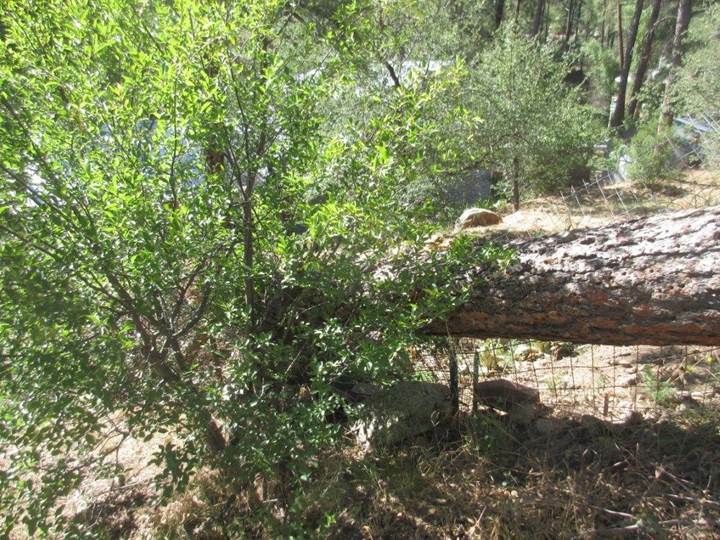 While the fourth page is titled “Vegetation Removal Tips: Undeveloped Properties with Native Vegetation” that page is extremely applicable to the “rural” areas of Prescott and Yavapai County in that many properties are more than a city lot having a home, landscaped area near the home and then undeveloped area which in many cases is several or more acres. All of these forms are extremely important and valuable in doing a “Firewise Assessment” in Yavapai County including local municipalities. (L to R) RANDY HAMMAN, DOUGLAS TAYLOR-GEBLER, HAP LOVEJOY putting up our FIREWISE sign upon their certification. Pinon Oaks gains Firewise Community status in 2018. 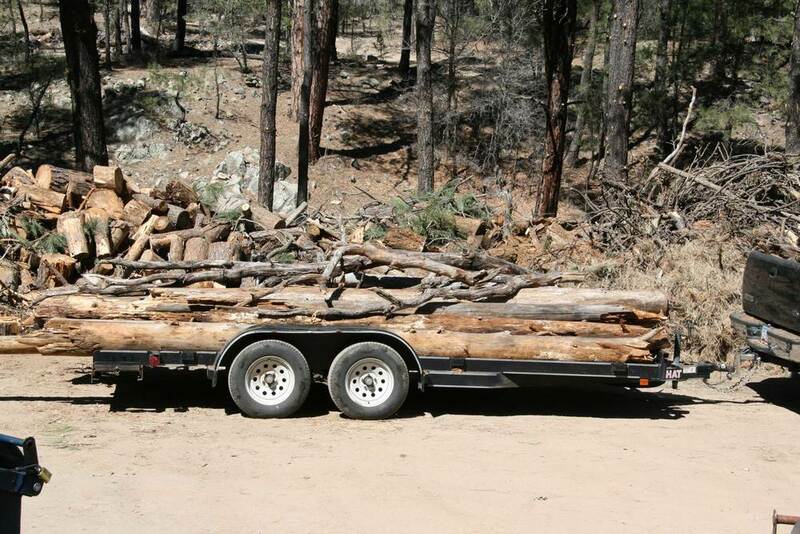 Click to read Appreciation Letter from community the Arizona Department of Forestry and Fire Management to recognize the work done by the Department of Corrections (DOC) Fire Crew during November 2017. Walker Fire Protection Association and Walker Fire District host the "Sundae Saturday" event along with a town hall meeting on the Goodwin Fire on August 5 at the fire station. Close to 100 people showed for the ice cream and town hall hosted by Supervisor Jack R. Smith. The agenda for the meeting included opening remarks by Jack Smith and Prescott National Forest's(PNF) Bradshaw District Ranger, Sarah Tomsky. It was followed by an overview of the Goodwin Fire by KC "Bucky" Yowell, PNF Assistance Fire Management Officer. Hugh Vallely, Yavapai County Office of Emergency Management discussed hazardous fuels mitigation and Firewise. This was followed by a discussion of the emergency evacuation routes used during the Gooodwin Fire by Bryon Jaspers, Director of Yapavapai County PublicWorks and Kendra Bull, Forest Engineer for PNF. This team answered numerous question from the audience and reminded people of the importance in registering for Code RED alerts with the Yavapai County Sheriff's Office. Prescott Area Wildland Urban Interface Commission Chairman, Bob Betts was there enjoying the ice cream with Walker Fire Protection Association president, Loren Bykerk. Jim Moore, President of The Mountain Club Board of Directors says, Thanks to all of you for your individual and joint efforts to make this year’s Picnic in the Park a great success! Despite the hot weather, it seemed to be quite comfortable in the shade (or at least not too oppressive). Thanks to Nelda Fetters and Rachel Wagener for excellent project management on arrangements for equipment and food. Absolutely glitchless! Thanks to Ed Cleckner for logistics support with setup and also for area prep. Thanks to the cooks: Catherine Gaffney, Pat Gaffney, Phil Oliver and Kevin Osterman. Thanks for help with setup, sign-in, T-shirts and breakdown to: Lyle Burns, Sue Burns, Karen Chronister, Ed Cleckner, Judy Hayes, Jacinta Nelson, Barb Poore, Jim Poore, Erin Swift & her son Tyrese, Phil Oliver, Robert Verri and many others. Thanks for help with food prep and service to: Sue Burns, Linda Collie, Molly Davis, Carolyn Haynes, Judy Hayes, Julie Rockwell, Cathy Smith and Judy Verri. Thanks to Barb Poore for once again making the water slide arrangements, and for signage. Thanks to Yavapai Firewise (PAWUIC) Chair Bob Betts for honoring us with his presence and inspiring us with his words. Thanks to Fred Witte for his work on setting up the new sound system for us. Special thanks to Mountain Club Firewise Chair Keith Fleming for his well-prepared and effectively structured Firewise Day presentation. Besides fulfilling one of the annual requirements for maintaining our recognition as a Firewise Community, Keith’s presentation was lively, entertaining and enlightening. And of course a special thanks to the Mountain Club Women’s Group for funding the entire affair this year, to save the expense from being borne by the membership. No funds were expended from the Mountain Club treasury for this wonderful event this year. Apologies as well as thanks to all those who assisted that I’ve missed. Attendee count so far is 92 total, about 10% of them guests. On September 9 PAWUIC Chairman, Bob Betts along with representatives from AZ Department of Forestry and Fire Management and the Natural Resources Conservation Service met with a dozen residents of a small community just south and west of our Haisley Homestead and Hidden Valley Ranch Firewise Communities. It was the initial organizational meeting for the Project Andrew community on the way to becoming a recognized Firewise community. Jenn Winters is the organizing chairperson. The community was coming together to honor the memory of Granite Mountain Hotshot, Andrew Ashcraft by becoming Firewise. This demonstrates that a community of any size can come together and begin the journey of becoming a recognized under the Firewise Communities USA® program of the National Fire Protection Association. 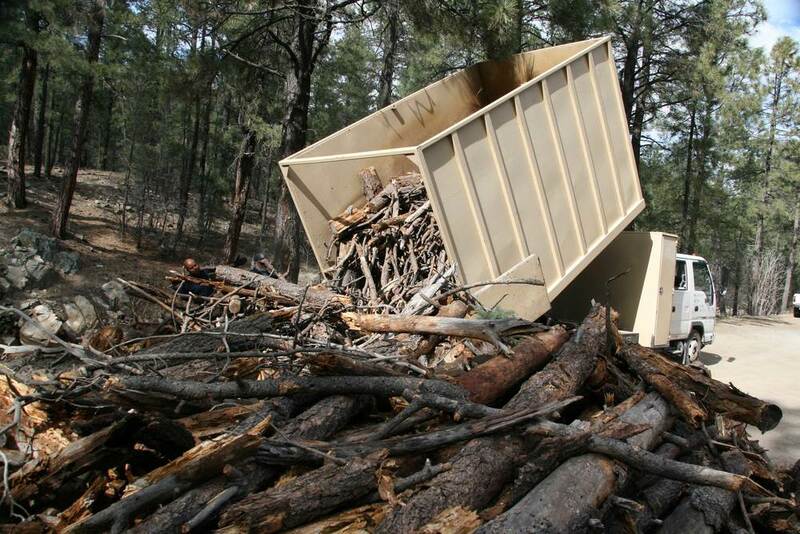 PAWUIC will assist Project Andrew members in conducting a community assessment in cooperation with the Prescott Fire Department and the Northwest District of the AZ Department Forestry and Fire Management. Then we will jointly conduct individual home assessments and help them obtain funding to begin mitigation efforts on each property. We look forward to them joining the other 32 Firewise Communities in and around the Prescott Basin. 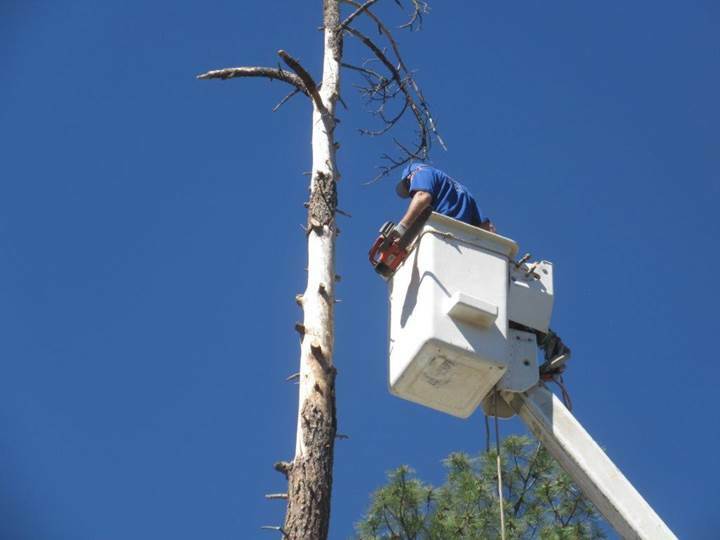 Removing side branches. Joe had already taken of the branches for about 12 feet below where he is. Joe knows what he's doing. He swung all the branches so they missed the wire. There were 3 guys hauling the sections away. The top is all gone here. Joe is carefully removing that critical section to clear the electrical wire. They ran the smaller branches through the chipper, and just tossed the trunk into the truck at left in 3- and 4-foot sections. Joe Morgan (owner) and Mark Jones. The other two guys already left in the other truck. Here's the other fallen tree before the work started. It had crushed a 10- 12-foot section of the side fence. Here's the part below that bush. Downhill neighbor Judy's friend had rolled a section off earlier. Joe's guys just cut the top part into 12-inch rounds so it could be used for firewood. Sixty-Five 65 people attended the Hidden Valley annual FireWise meeting and barbecue event. not only provide beauty for the garden but are also firewise. J.P. Vincente, retired Prescott Fire Department & owner of Angel Sun Landscaping, provided an excellent overview of a firefighter’s perspective of protecting your home by creating defensible space. Bob Betts, PAWUIC Chairman, discussed the fire threat to our community and the importance of repeat mitigation of fuels surrounding our homes. Marie Trudeau, Hidden Valley Ranch resident, claims her FireWise plant door prize, which was one of many donated by local nurseries: Watter’s Garden Center, Native Garden, Mortimer’s Nursery, Prescott Valley Nursery. Forest Trails held its Firewise Day on May 16. More than three dozens residents attended to hear a presentation on the evacuation routes and evacuation procedures for their community. Matt, a volunteer for the Sheriff's Jeep Posse gave a quick history of the posse and then detailed how they had mapped the Forest Trails community for evacuation under any emergency when the Yavapai County Sheriff's office calls up the posse. John Alden, Firewise Chairman, and his committee members rewarded the community for its ninth year of being a Firewise Community with a bowl of ice cream with all the fixings. Thank you to John, his committee and all of the Forest Trails community for being Firewise. The Foothills Property Owners Association held its annual Firewise Day and Annual Meeting on March 28, 2015 with nearly 30 people in attendance. The Foothills includes 82 lots on a total of 80 acres with 20 + acres dedicated open space. Located within the City of Prescott, the development was platted in 1995 and first achieved Firewise Certification in 2008. Over the years, property owners have been very involved in education programs and with the assistance and support of PAWUIC, very successful in using grant funds to treat their property to Firewise standards. The photograph shows a portion of the Association’s open space which was treated 3 years ago. The Association Board is setting aside funds each year for the purpose of maintenance of Association land. Highland Pines' Properties Owner Association president Fred Ferguson reports that they held their Firewise Day on May 23rd. More than 60 community members enjoyed a lavish spread of sweets and ice cream. Guest speakers were Marty Borgelt and retired forest service expert, Ken Karkula talking about what to do BEFORE the evacuation notice is given during an advancing wildfire. They pointed out the assistance that would be provided by the Yavapai County Sheriff's Jeep Posse once an evacuation is declared. They also pointed to a helpful brochure titled "Ready, Set, Go." Preparation for an evacuation is critical. Karen Sable-Goldstein, Highland Pines resident and leader of Animal Diaster Services described preparedness for pets and live stock. Bob Betts, Chairman of PAWUIC, congratulated the residents of Highland Pines as they celebrate their tenth anniversary of being a certified Firewise Community. Twenty- eight members of the Manzanita Village Cohousing Community worked together to make their property more FireWise. Afterward they enjoyed a fine lunch prepared by members of the community and heard more about local emergency management from Danny Faulk, the Yavapoa Count Emergency Management Coordinator. At their annual meeting and FireWise Day June 2015 Jonny Schaffer of Jonny's Landscaping and Tree Service met with Rancho Vista Hills homeowners. UPDATE: By mid-April, the Walker Community managed to remove 80 tons (!) of chips. They anticipate removing an additional 40 tons before the end of the month. That's not all. 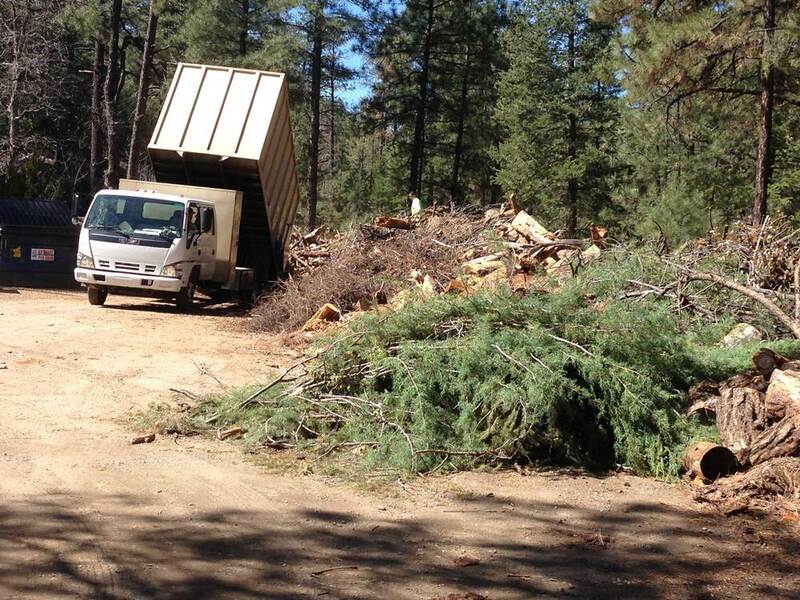 As soon as the current pile is removed, they will be building another slash pile to be chipped May 17. Congratulations! 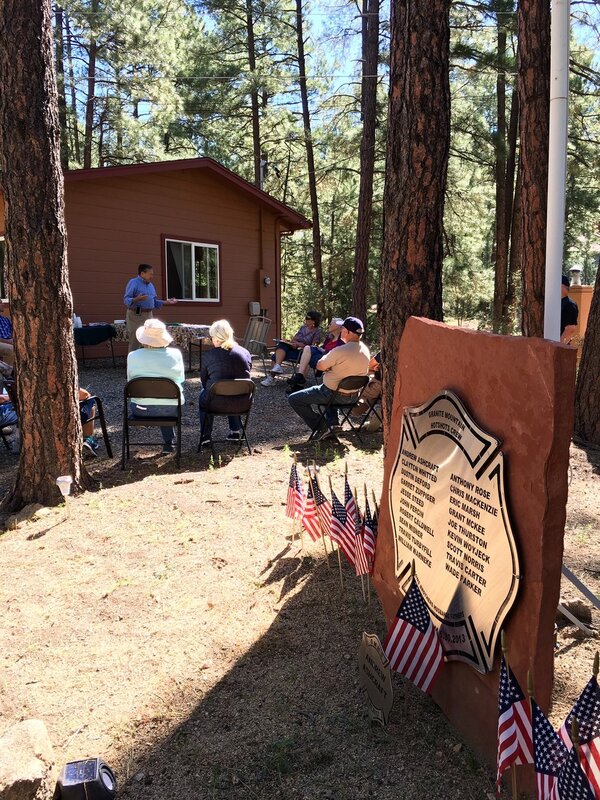 Ponderosa Park, a newly certified FIREWISE Community held their first FIREWISE activity on May 3rd at the local Fire Station. They had 2 dumpsters and a chipper, which was manned by local Fireman Mike Pacheco and another volunteer Fireman,Thaddeus McQuire (the picture of the 2 guys with the cake). 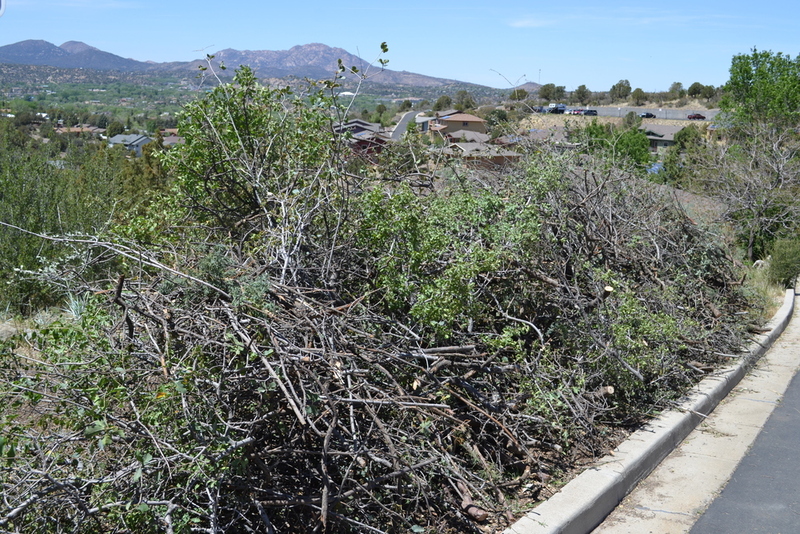 Local community volunteers and FIREWISE Committee members helped residents unload pine needles, slash and brush into the dumpsters and chipper. The FIREWISE Committee gave out educational material and thanked all the residents for coming together as a community to create defensible space in Ponderosa Park. The FIREWISE Committee, along with the Ponderosa Park Association, will plan another event this summer. Manzanita Village celebrated its 4th Annual FireWise Day with 45 people helping to make clean out another portion of our property. The work party was followed by lunch and a presentation by and presentation by Bob Celaya, Forest Health Specialists, Arizona State Forestry Division.